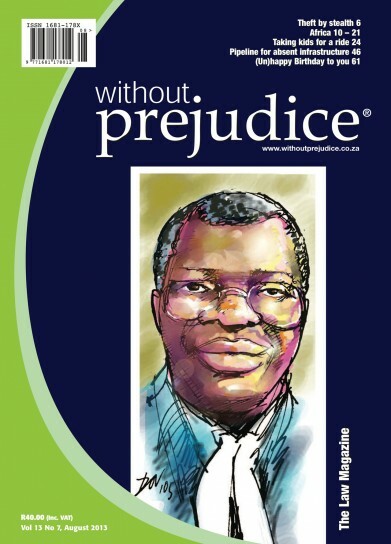 The lead article in this issue is by Anthea Jeffery, who leads special research at the Institute of Race Relations. It is important and scary and deserves to be read thoroughly and with care. What is it about power that has the ability to corrupt? In this past month the Vatican Bank's Monsignor Nunzio Scarano was arrested by police on allegations of planning to smuggle into Italy €20m in cash from Switzerland on behalf on behalf of shipping industry friends. Officially called the Institute for Works of Religion – IOR, the Bank was dubbed “the most secret bank in the world" last year by Forbes. The Vatican Bank manages Catholic Church funds amounting to more than €7bn. It made a net profit of €86.6m last year. Three recent bills making expropriation quicker and cheaper for the state could put the property rights of business owners and all other South Africans at risk. However, this risk has been downplayed by the press, which has generally depicted the bills as applying only to commercial farms. This is not the case. Gone are the days when selling property was a simple process. With increasing developments in law, more and more obligations have been placed on a seller of immovable property. It is now, more than ever, prudent for a seller to familiarise himself with what is required of him at the outset of the sale process. This will allow him an opportunity to budget for those hidden expenses that may surface later. Competition law is not new to the African continent. The formal adoption of competition laws by African states, however, is on the steady increase. This is likely due, at least in part, to Africa featuring more strongly on the global investors' radar and the continent's growing attractiveness to those in search of stronger growth and better returns. China frightens the West" – at least so says the well-known columnist Martin Wolf in his Financial Times leader page article: Why China will not buy the world (Wednesday, July 10). A new trade mark law came into force in Ethiopia on December 24 2012, creating a formal trade mark regime for the registration and enforcement of trade mark rights. Before the new law came into effect, the only way of obtaining any form of trade mark protection in Ethiopia was by the publication of cautionary notices. The new law makes provision for a statutory registration process in line with many other jurisdictions. Perhaps owing to the highly charged political atmosphere in Kenya over the last few months, the enactment and assent of a new NGO law may have passed unnoticed. Does withdrawal of a threat of opposition amount to a surrender of your rights to institute cancellation proceedings in respect of the same trade mark? Uganda is considered to be one of the fastest and most consistently growing economies in Africa. This emerging market lies astride the Equator in Eastern Africa and covers a total area of 236 580sq. km with a population, last recorded in 2011, of 34.5m people. Africa is not one market. It is a shifting, rapidly-evolving continent of 55 markets, each with distinct legislative hurdles, barriers to entry and insurance trends. One-size-fits-all approaches to doing business in Africa, or the syndication of entry strategies, are risky options for insurers. The Supreme Court of Appeal (SCA) delivered judgement on May 29 in a case that many had been hoping would provide clarity in an area of law recently under the spotlight. The Western Cape High Court, in a bold judgement against Woolworths, has ordered that its franchisee in Kokstad be allowed to continue trading until 2019, in spite of an agreement extending the franchise only until September 2013. Legal standing to sue is a crucial component of any litigation. A plaintiff needs to assure itself that, all things being equal, it is the party to whom relief is owing and furthermore needs to be satisfied that the defendant cited, and not another party, will be liable if all other elements of the cause of action relied upon, are proved.